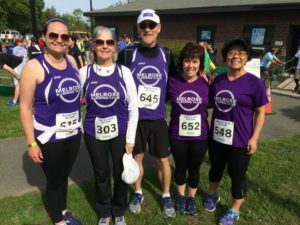 This past weekend a small contingent of Melrose Running Club members ran the Mystic River Herring Run 5K. No one tried the paddle part of the race, but it did sound like it would be a lot of fun. Over all, 258 runners finished the race and MRC had five runners. No PRs or medals to bring home but I think we all had a good time. Mary O’Connell and Thuy Dang have run all of the Melrose Racing Series races this year! I think they really want those jackets! Rain had been forecast for Saturday morning, but we ended up with near perfect running weather. A little rain later in the day gave us all a good excuse to stay inside for a while! The race was based out of the DCR Blessing of the Bay Boathouse on Shore Drive in Somerville. Shore Drive is a neighborhood street that connects The Fellsway with Rt. 38. I drive by it every day but have down the street only once or twice before. The DCR boat house is right next to Rt. 93 and on the bike path along The Mystic. If anyone is looking to take a canoe or kayak out on The Mystic, this is the place to go. Apparently you can go anytime and rent one, no reservations required. Some of the crew boats you see on The Mystic are based out of this DCR boathouse as well. There’s a lot going on over there! The entire race was on bike path and sidewalks through the park. We didn’t cross any intersections or have to run in the road at all. We all started in the back of the pack, so the first half mile along the bike path was packed. Instead of lining up we hung out and had a good conversation. 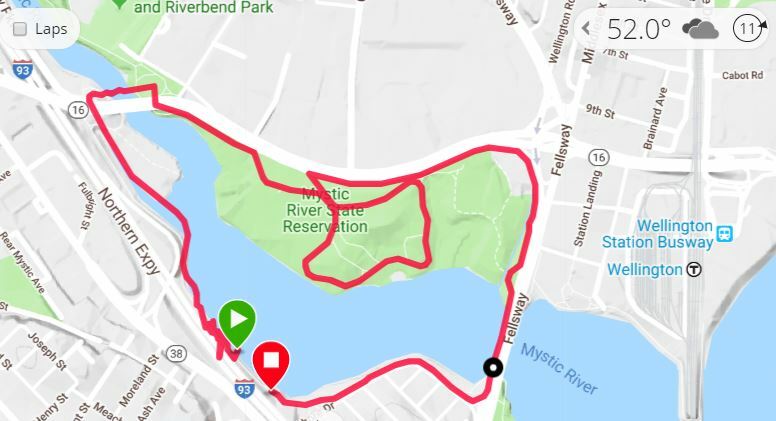 You can see from the map above that they had us winding around the Mystic River State Reservation in Medford for a bit. Running along the river and through the park was pretty cool. They had plenty of volunteers to direct us at the many turns and provide encouragement. After the race we hung out for a while, but we all had other things to get to, like yard work. As they announced that paddle racers should start getting ready for their races, we all made our way home. Our next race is the Melrose Firefighters 5K on June 17th. Don’t forget to register! This entry was posted on Sunday, May 20th, 2018 at 5:45 pm	and is filed under Club Races. You can follow any responses to this entry through the RSS 2.0 feed. You can leave a response, or trackback from your own site.